Queen St East Presbyterian Church, 947 Queen St E.
Class limited to 12 students with performance background – artistic resume required. You don’t create your clown; you simply let it out to live in front of others. This is a workshop for artists who wish to discover and/or develop their clown character by working on: simplicity, sincerity, lightness and vulnerability of play. Using Francine’s unique method, the work proposes a series of exercises that develops openness, pleasure, creativity, rhythm, physical precision and being able to listen to your own emotions and impulses. Ideal for the clown artist with Pochinko-influenced training who wishes to explore a complementary approach to clown as well as artists new to clown who wish to discover their unique clown persona. Francine Côté is a clown/teacher/director from Montréal who has more than 30 years experience in the creation of comic, physical and clown characters. She has played on the International scene (Circus, Cabaret, Variety’s, Festivals), taught in a diverse range of schools (National Theatre School of Canada, Ecole National de Cirque, Ecole de l’Humour (Just for Laughs) and the University of Montreal), and has worked as a stage trainer for different companies (Cirque Éloize, L’Aubergine, En Piste…etc). While touring with Le Cirque du Soleil in London and Paris in 1990 Francine met her partner in clown and life, James Keylon, and this was the beginning of a long-term international career as the duo, “Alfredo et Adrénaline”. Pushing in the direction of the modern clown, but inspired by the traditional, these two lovable characters in the throes of their own “Battle of the Sexes” have touched thousands of spectators around the world. 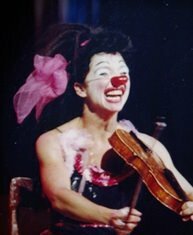 Francine has developed a method of clown training for the professional milieu based on her years of experience as a performer and her early training in Paris with Phillippe Gaulier and Monica Pagneux. Since 2002, she has taught more than 15 workshops a year and continues to train clowns at theatre schools, abroad, and through special coaching. Francine is also the primary clown trainer for Dr. Clown, a company that brings professional therapeutic clowns into hospitals and long-term care facilities in Montreal, Quebec City and Toronto.